This post was sponsored by S&W Beans and all opinions expressed in my post are my own. 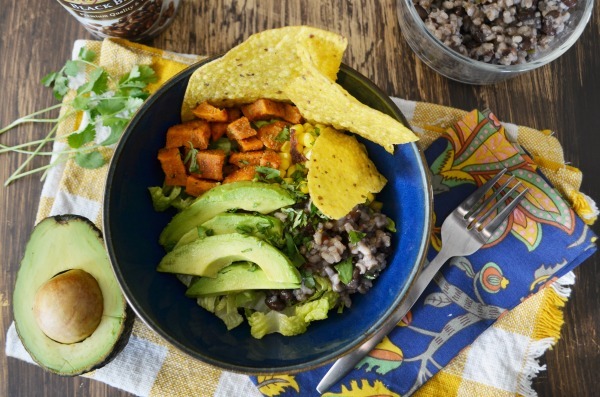 Test out this recipe for burrito bowls for a hearty back to school dinner solution. This season has brought on many new changes and challenges. For the first time in 5 years I have a full-time job to wake up to. For the first time ever both kiddos are in school all day. While I miss those kiddos like crazy it feels amazing to have normalized work hours. Sometimes though that means dinner is a rush to get on the table after school. That’s when I turn to pantry staples like, S&W Beans. They make putting healthier food options on the table easy and convenient. Another big change as of recent is my husband is sticking to a mostly vegan diet. There’s nothing that throws a wrench into the dinner menu than one person on a restricted diet. The positive outlook is one kiddo was already a selective vegetarian and the oldest and myself have a moderate dairy sensitivity. I know everyone can always agree on any dish with beans. 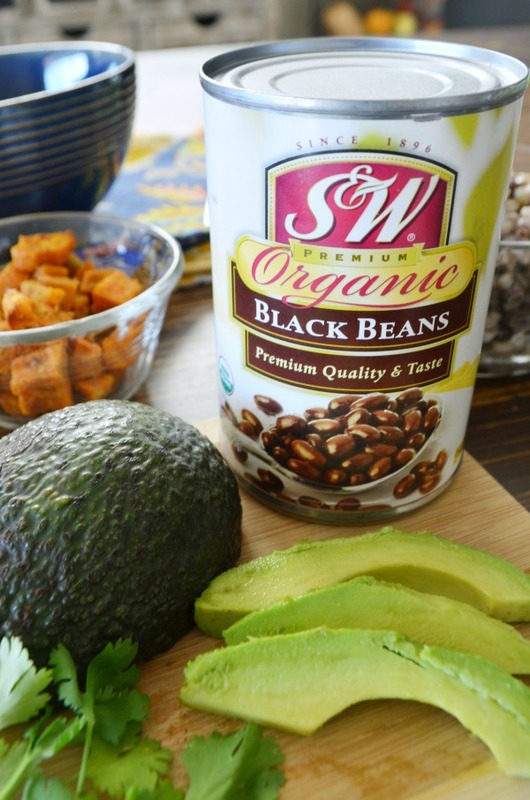 S&W Beans look great and taste great, and are an easy way to pack in the protein for a filling meal. 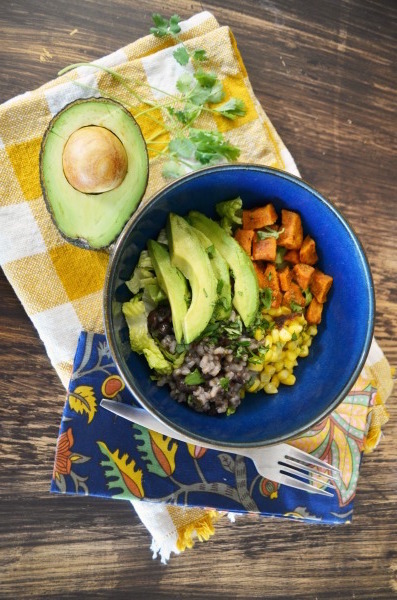 We’ve been testing out old favorites with a spin, and the first up was a classic taco salad, we like to call burrito bowls. Think less salad and more of the good stuff, the toppings! 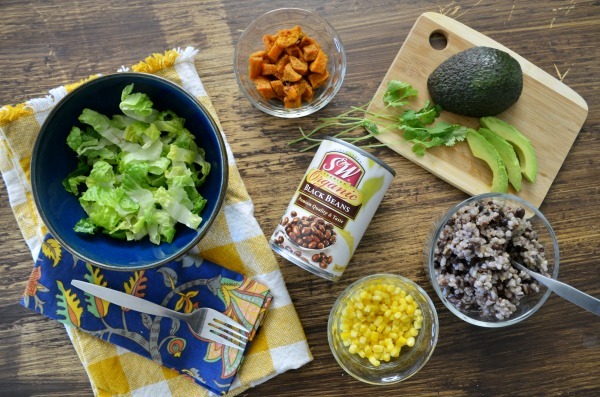 It’s an easy go-to recipe in a pinch and tastes great packed away for lunch the next day. 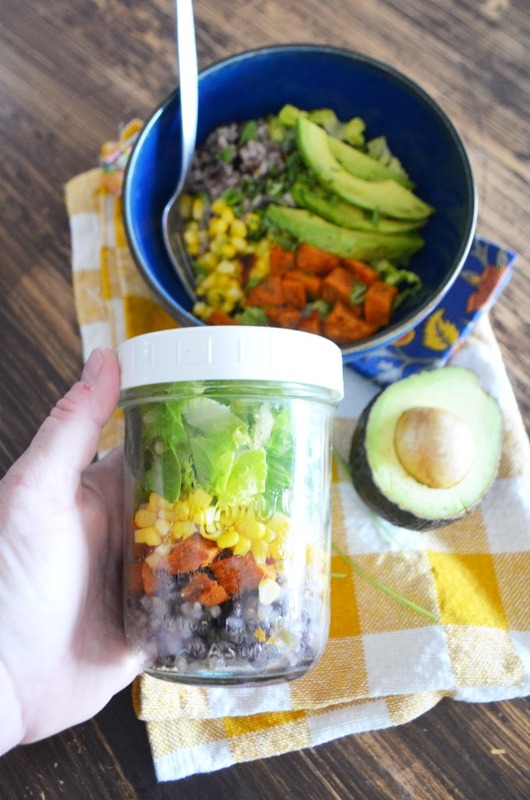 Just pile the ingredients in a mason jar; softer and wetter ingredients on the bottom topped with lettuce. 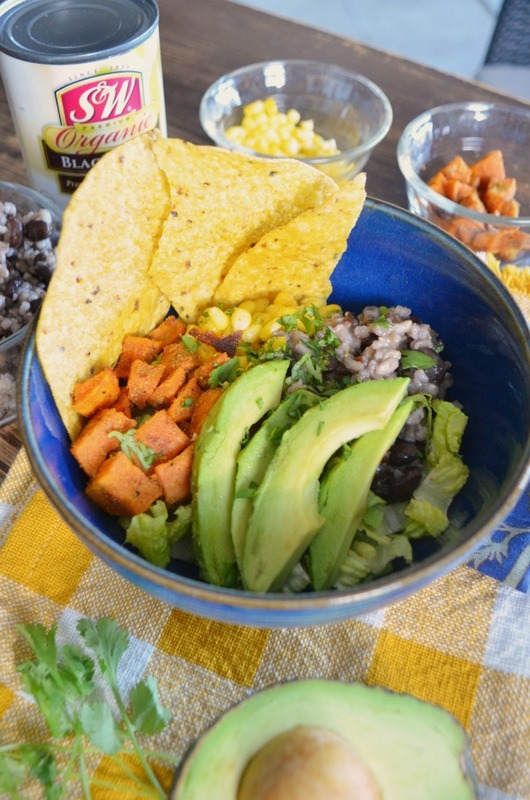 Pack in your favorite dressing or salsa on the side for a tasty mid-day meal. We tend to toss whatever we have in the pantry or freezer or can grab fresh at the store. 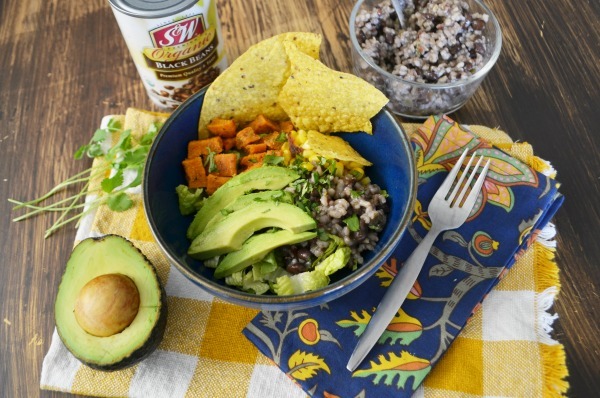 This time we enjoyed a sweet and savory with a hint of spice burrito bowl. Everything from the rice and bean mixture to the roasted sweet potato can be prepared ahead of time and assembled at mealtime. This made for a simple and hearty after school dinner. Prep your rice mixture and sweet potatoes ahead of time. Add green chilies, garlic salt, and onion powder to a mixture of rice and S&W black beans. Season cubed sweet potatoes and roast in the oven until golden. Place a layer of romaine or your favorite green skin the bottom of a deep bowl. 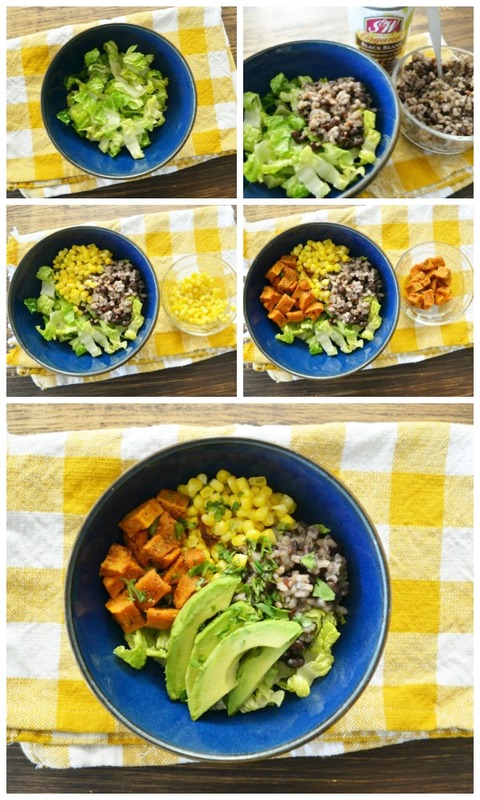 Scoop spoonfuls of rice and beans, sweet potatoes, and corn on top. Finish with fresh slices of avocado or a dollop of guacamole. Personally I enjoy mine with a spoonful of medium salsa and a sprinkle of sharp cheddar. S&W beans has been delivering quality products for over 120 years. They offer the versatility from classic favorites to additional varieties like 50% less sodium and organic options. 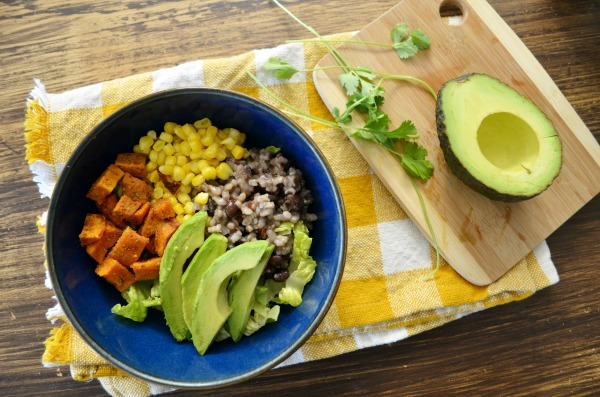 For our burrito bowls this week we tried out organic black beans. Save time AND save money right now through 12/31/2017 with a $1 off 2 cans offer on S&W Beans. Grab your coupon to print on the S&W Beans website here. What mealtime shortcuts do you take to get filling and better for you meals on the table during the school year?